To understand why the armpit hit is a bad move, we will first explore the general case of such an approach, know as the angle play. In general, a diagonal approach to an opposing stone is what is known as an angle play. Angle plays are usually a little awkward, because the opponent has the local advantage of having sente in a symmetrical position. They are therefore usually special purpose moves. 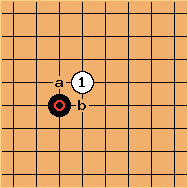 In this diagram, after , black will usually continue with either a or b. So black has the advantage of getting to choose the direction of play. 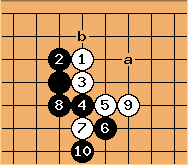 After , white usually wants to continue with the stretch at a or the one point jump at b. In rarer circumstances, the hane at the head of one and a half at c may be good, although usually it is too risky because it is easy to cut. In the case of the armpit hit, if black plays , the normal continuations of a and b are weak moves, because they are on the second or first line. The move at c is not as risky here, but is still on the second line. is overconcentrated. This depends on the position to the left. a, b or c are acceptable moves, for example to make quick life. d is good, for example to make quick life again. is a popular continuation of the armpit hit among beginners. This is, again, a bad move. White is pushing from behind and Black gets sente again in a symmetrical position, and can play a strong hane at the head of two with either of the points marked a, or stretch or jump with b or c.
Here is one possible continuation sequence. 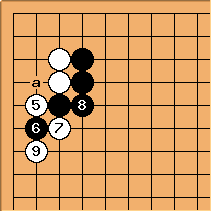 Note how white is getting pushed around, and at the end white's position still has weaknesses at a and b. Here, is technically an armpit hit. But this invasion is seen regularly, so it can't be bad, can it? Well, first thing to note is that the 3-3 invasion is bad when it is played too early. and are still good moves. Usually, the invasion will be played when the resulting outside wall is overconcentrated, or easy to neutralize. A second thing to keep in mind is that with the other edge close by, the double hane of is not as good a move as it was earlier. Due to the closeness of the edge, white can cut and capture here. 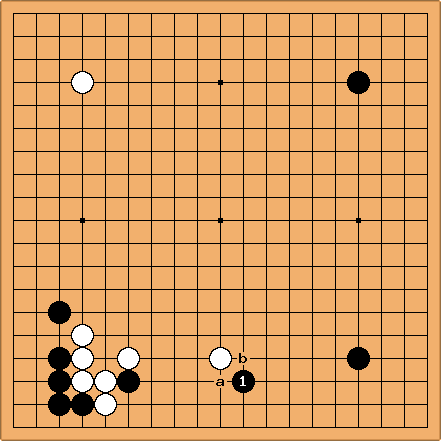 If the edge was not so close, black would escape out with and white's position would be a disaster. 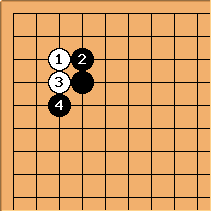 Note: this line is still joseki, because black can cut at a and capture two stones. see 4-4 point 3-3 invasion double hane. Here, by Pak Chi-eun is an armpit hit. The marked white stones are heavy, and are inside a strong black sphere of influence, so White wants to make life quickly. 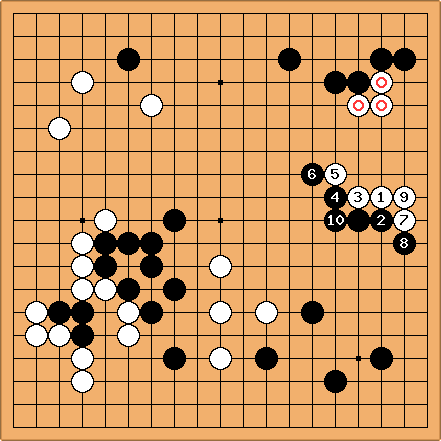 After , white has achieved this in sente. 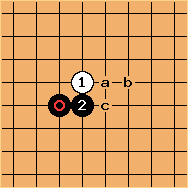 If white plays like this, the circle marked area is overconcentrated, and there is still the aji of the clamp at a.